Modern graph clustering applications require the analysis of large graphs and this can be computationally expensive. In this regard, local spectral graph clustering methods aim to identify well-connected clusters around a given “seed set” of reference nodes without accessing the entire graph. The celebrated Approximate Personalized PageRank (APPR) algorithm in the seminal paper by Andersen et al. (in: FOCS ’06 proceedings of the 47th annual IEEE symposium on foundations of computer science, pp 475–486, 2006) is one such method. APPR was introduced and motivated purely from an algorithmic perspective. In other words, there is no a priori notion of objective function/optimality conditions that characterizes the steps taken by APPR. Here, we derive a novel variational formulation which makes explicit the actual optimization problem solved by APPR. In doing so, we draw connections between the local spectral algorithm of Andersen et al. (2006) and an iterative shrinkage-thresholding algorithm (ISTA). In particular, we show that, appropriately initialized ISTA applied to our variational formulation can recover the sought-after local cluster in a time that only depends on the number of non-zeros of the optimal solution instead of the entire graph. In the process, we show that an optimization algorithm which apparently requires accessing the entire graph, can be made to behave in a completely local manner by accessing only a small number of nodes. 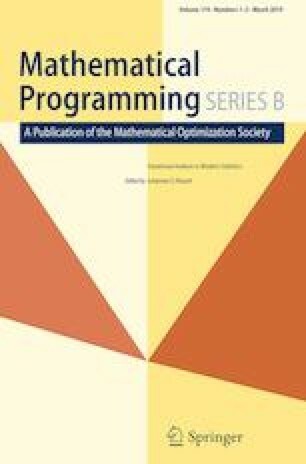 This viewpoint builds a bridge across two seemingly disjoint fields of graph processing and numerical optimization, and it allows one to leverage well-studied, numerically robust, and efficient optimization algorithms for processing today’s large graphs. A preliminary version of this work appeared with the title “Exploiting Optimization for Local Graph Clustering” as a technical report . MM would like to thank the Army Research Office and the Defense Advanced Research Projects Agency for partial support of this work. JS was supported by the Miller Institute for Basic Research in Science at UC Berkeley. JS would also like to acknowledge the Miller Institute for Basic Research in Science at UC Berkeley.